Scientist Vera Rubin noticed one of the strangest anomalies back in 1976. Stars move faster further away from the center of galaxies, but Isaac Newton’s laws say that once you get to the galaxy’s edges, where there’s a lot less observable stuff, the remaining stars and gas should move more slowly. Instead, Rubin observed the matter at the visible edges of galaxies spun at similar speeds to, or faster than, the stuff closer to the middle. This implied there was more matter (and more gravity) beyond what she saw, caused by something none of our experiments can observe. But a new set of observations show that some incredibly distant, and therefore very young (but ancient, like a fossil) galaxies seem to behave differently than the ones Rubin and others have observed. This doesn’t disprove the so-called “dark matter” gravitational anomaly we see today. It does imply that certain early galaxies are way different from the ones we observe nearby. This could clue us in to how young galaxies transformed into ones like ours, and the role dark matter played in this transformation. These galaxies are on the order of billions to tens of billions of light years away. Genzel’s team’s observations come from looking at specific kind of infrared light coming off of hydrogen atoms whose electrons lose a little bit of energy, using instruments on the Very Large Telescope in the Northern Chilean desert. They had to look at a selection of galaxies for several months to collect all of the very faint light needed to do their analyses, much of which was published in the journal Nature today. Even taking into account any potentially confounding factors, like gas between Earth and the stuff they were observing interfering with the data, the scientists concluded these distant galaxies didn’t behave like the galaxies in our cosmic neighborhood. They illustrated this with maybe the easiest-to-understand physics graph you will ever see, below: As you get to larger distances from the center of a galaxy, from left to right in the graph, the velocity of matter increases, then drops off in all six of the galaxies on the lefthand graph—these are the distant galaxies. The data on these galaxies’ velocity curves are averaged into the grey area on the righthand graph, different from the our own Milky Way, our neighbor Andromeda (also known as M31) or average nearby galaxies, where the speed of matter either doesn’t drop off or increases further from the center. This doesn’t mean we’ve disproved dark matter, by any means. Instead, we might be looking at the way baby galaxies make their stars. “This paper is not about dark matter,” Anže Slosar, who leads his futile existence as a scientist and a bureaucrat at Brookhaven National Labs, told Gizmodo. 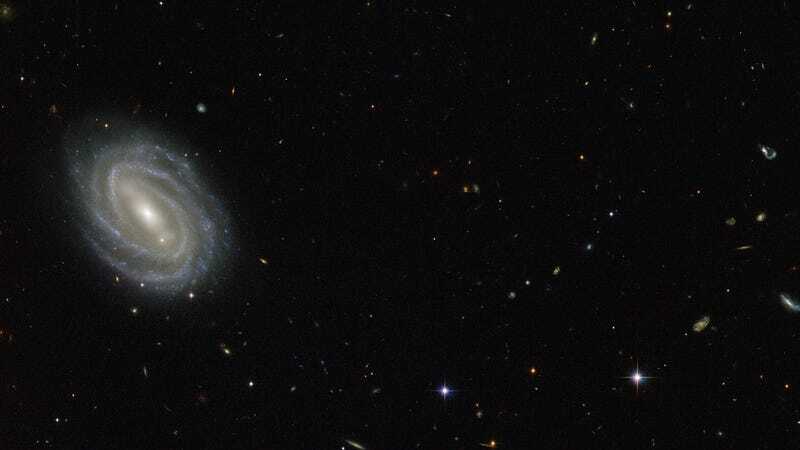 Instead, the scientists have observed that this set of distant galaxies are mostly dominated by ordinary gas instead of dark matter, with more turbulence causing the gas to slow down and possibly fall into the galaxy’s center. “This is consistent with early universe where you have lots of molecular gas, fuel for stars lying around and it can... produce violent star formation.” He said we still need a halo-shaped skeleton made from dark matter to begin with, but that there’s so much gas in these early galaxies that the behavior of the gas dominates our observations. Scientists need to be cautious before making statements about the nature of these distant galaxies, though. “An important caveat is that this is not true for all galaxies at that redshift, but for this particular subset of galaxies. They chose [to study] these, because they are comparably easy to observe,” said Slosar.